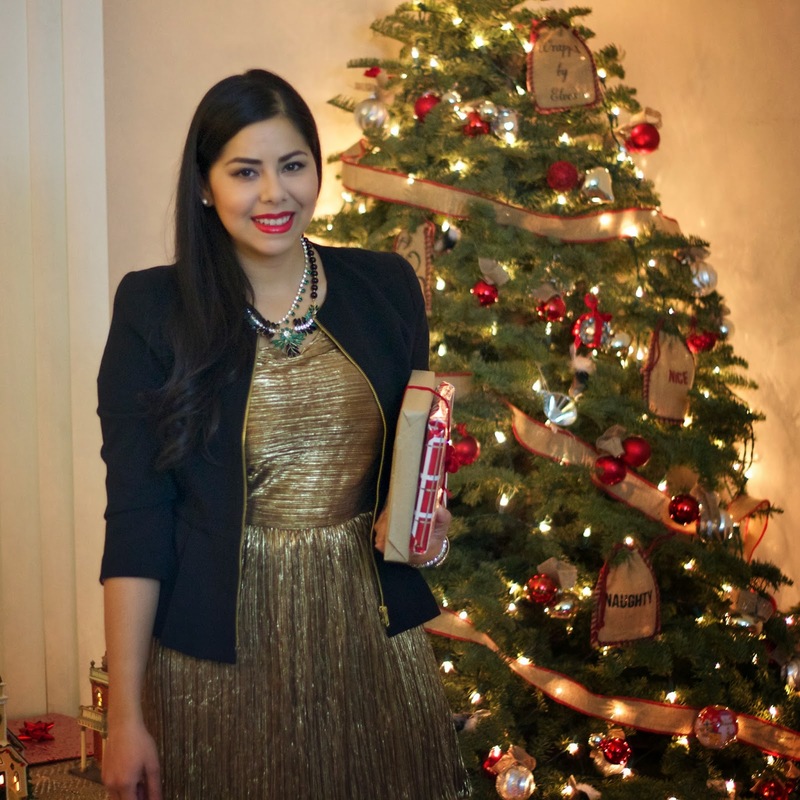 I decided to do holiday glam for Christmas eve wearing this little gold dress I picked up at a local boutique and added a green toned sparkly necklace because you can't have enough sparkle on Christmas! I hope that you are all enjoying your Holiday season! Much love from my home to yours! 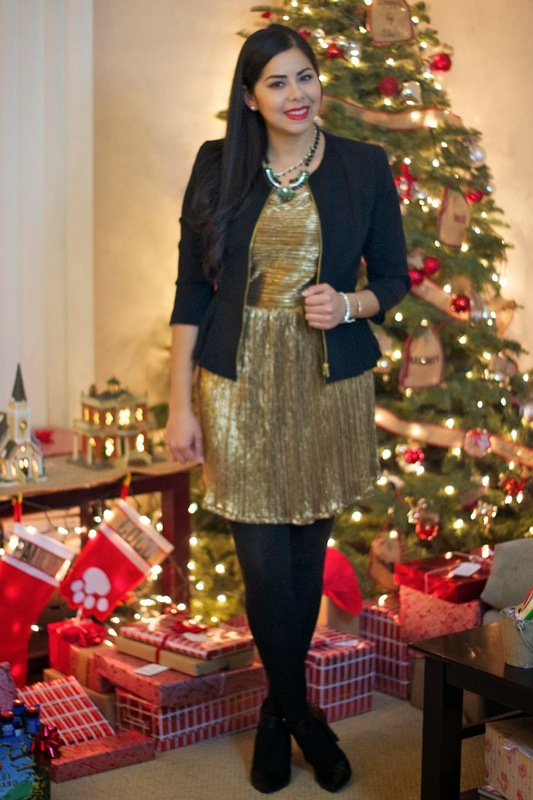 About the Outfit: Gold Dress (similar / similar), Forever 21 Blazer (similar), Prima Donna Necklace c/o, Marshalls tights c/o, Nine West shoes via Marshalls c/o, Charming Charlie bracelets c/o. Love that dress! Ithink is a great choice for Christmas celebrations! Fabulous dress, can't think of a more perfect dress for the day! You look so gorgeous Pau, adore the pics with the tree in the back, so cute! that dress is definitely the perfect choice for christmas! Love it! Such a fab dress! Lovely blazer and dress! Thanks for stopping by, following you now on GFC and bloglovin! Now waiting for you! you are so beautiful! that dress is absolutely gorgeous! it's sharp! love your makeup and hair too! Love love love you holiday look. I agree, no such thing as too much sparkle. Wow, that is a STUNNING dress and a perfect holiday outfit. I hope you had a nice Christmas!! You look GORGEOUS paulina! totally love your outfit! I am in love with your dress!!! It's awesome!! Love the complete look on you. Would you like to follow each other on GFC? Please let me know on my blog so I can follow back. Thank you. Hey girl! Hope you're having a wonderful holiday season! You look gorgeous! Love the gold dress! 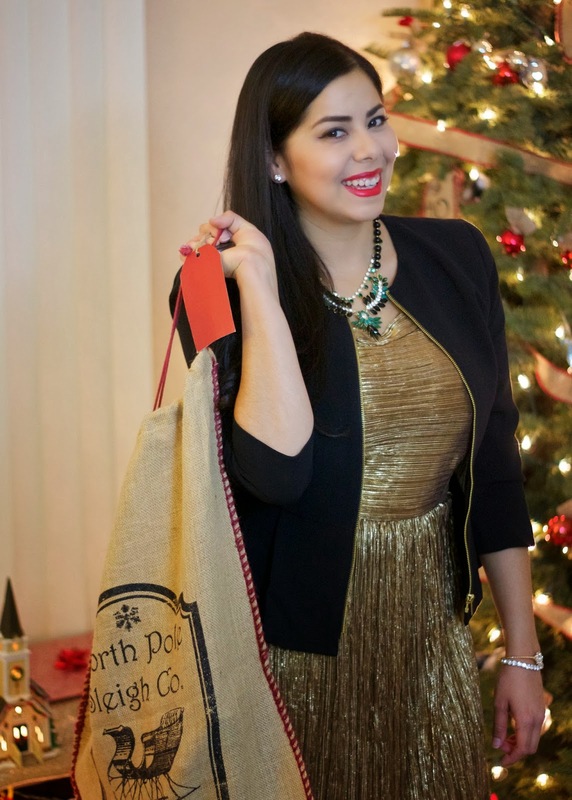 So festive, glamorous, and perfect for the holidays! Wishing you and yours a happy, healthy, and prosperous 2014:)! Hope next year is even better than the last! The dress is beautiful and love how you styled it. I hope your holiday was wonderful Paulina.